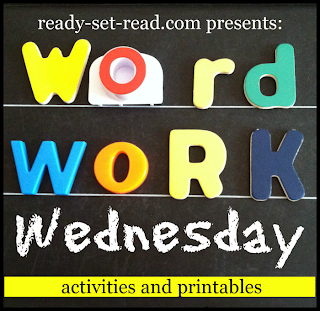 Every Wednesday on Ready-Set-Read, I'm sharing about word work. Last week on Word Work Wednesday I shared "What are Word Families?" as well as a free printable word family list. This week I want to share some hands on ideas for working with words. Word work activities may include sorting, writing, and games. I've also been pinning resources to Pinterest. You can find lots of activities and games for learning word families. Check out my Word Study: Word Families board. I'd love if you'd follow while you are there! 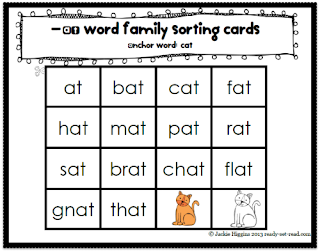 When teaching word families, children can sort words by word families. Choose 2 word families to sort. Place the anchor word card and picture card at the top of the sort. Explain that the rest of the words should be sorted under the appropriate headers. Model sorting the words. Sort the words, and then read down the list starting with the header each time. Invite the child to try sorting. After sorting, point out features of words or guide children to self correct any mistakes. If you would like premade word sorts, anchor word picture cards, and sorting mats, check out my short vowel packs in my store here. These packs also include the activities below. Children need to transfer word study to writing. You can introduce this by having children write words, label words, cut and paste pictures. Begin with words children know or allow children to draw pictures of words. Children may begin by drawing pictures of words in the -at family. Then they may label pictures. After children become confident at sorting picture or word cards in word study, give the child a word family and have him or her write known words in the correct category. 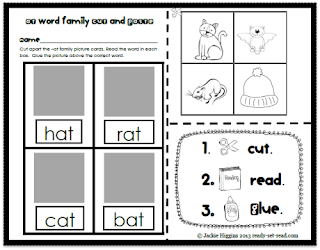 Here is a sample of a word family cut and paste activity. Games are also a fun way to work with words. You can create simple board games with words that children need to read. 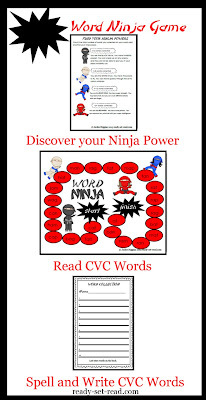 One word work game that is a favorite of my boys is WORD NINJA. This is a game board of short a words. This game involves reading short a words AND writing short a words. Children roll a die and read the word on the space. If the child can read the word correctly, he or she adds it to a word collection page. At the end of the game, players add up the words they have collected. The number of words they collect tells them their "ninja powers". My son Logan wants to play this again and again, giving him an opportunity to be a different ninja. I love that he'll play it over and over again because it gives him lots of practice reading and writing short a words. This word work game is included in my Short A word work pack. 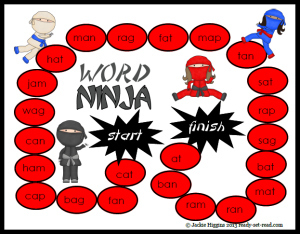 This pack includes word sorts, worksheets, and the game. You can find it in my store here. Come back next Wednesday for a little extra information on word work versus spelling.